With a continuously ageing population, the number of residents of retirement homes and nursing facilities is constantly growing. As a result, it is becoming more and more difficult to give each patient the sufficient time and attention they need. In order to reduce the workload of nursing staff and caregivers and to give the residents an additional sense of security, TeleAlarm offers nurse call systems for nursing facilities and at-home operation. Using detectors, software systems and accessories, elderly people and those with physical disabilities can be supported. With TeleAlarm’s NurseCall systems, not only can workload be reduced, but the residents of retirement and nursing homes are also given a bit of their independence back. Residents can call the nursing staff in the event of an emergency with the aid of a pendant or wristband transmitter. The nursing staff are notified immediately via a NurseCall Main Unit and telecommunications and detector systems such as a phone system, DECT systems, paging systems or a light calling system. This means that the staff requirement is also reduced for certain areas of a nursing or retirement home. The NurseCall systems are easy to install and are suitable for nursing homes as well as retirement residences and assisted living facilities. In addition, TeleAlarm’s NurseCall systems offer integrated dementia monitoring. Using this, dementia patients can freely move within a certain area. The nursing staff are only notified via the system if a patient leaves this area without supervision and can then react quickly to the situation. This means that the security of the resident is ensured without unnecessarily restricting their personal freedom. 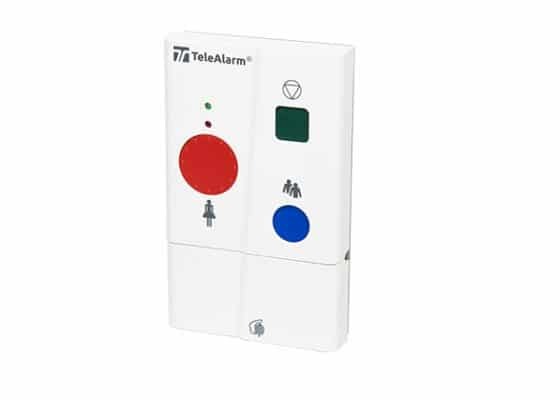 TeleAlarm NurseCall systems can be installed quickly and easily, modernised affordably at any time or, if necessary, can by expanded with additional accessories. An example of such an expansion module is the CareSOFT Alarm Server. It combines several calling and display systems and ensures optimum usage of previously existing hardware. The CareSOFT Alarm Server functions as the interface between the different patient calling systems and alarm contacts and their display devices. Due to its precise display of the emergency location of the device triggering the alarm, the nursing staff can help the resident more quickly and more effectively. In addition, via the CareSOFT Alarm Server, all events are saved in a database through which different information can be specifically queried and evaluated. This means that work processes can be organised flexibly and affordably within a retirement or nursing home. This in turn can result in a reduction of work. NurseCall systems (or also nurse calling systems) are our solutions for nursing homes, hospitals and other facilities. The NurseCall Main unit is the control panel of a radio system which is easy to install and can be used for facilities such as nursing homes or assisted living. The NurseCall Main unit is particularly suitable and easy to operate for residents such as dementia patients who have physical and mental disabilities. The NurseCall Relay unit is a complete radio system which is suitable for care facilities, nursing homes and residential facilities. It facilitates work for the staff and simultaneously creates more security for the residents and the persons to be cared for, with optimised monitoring and more freedom of motion for nurses and residents. The NurseCall Relay Plus unit not only offers unique and easy installation, making it suitable for assisted living, nursing homes and other similar facilities, but also allows patients to transmit a warning signal to the nursing staff directly and easily with a transmitter. The LE10 Radio Receiver makes it possible to receive radio signals from different radio transmitters on the frequency 434.01 MHz. Moreover, it has a green and a red LED display. With this it can react to the received radio signals. The Alarm Server CareSoft combines different call and display systems and thereby uses the existing hardware better, more conveniently and more flexibly. Usually various systems are used in retirement and nursing homes: CareSoft is the interface. If you have questions or require other information, please feel free to contact our employees. We will be happy to further assist you. The NurseCall accessories are what make our nurse call systems perfect – logical solutions for nursing homes, hospitals and other facilities. A user-friendly manual transmitter such as the Wrist Transmitter S37 offers you the good and reassuring sense of feeling secure at every location and to always be in connection with the help centre, which can help you at any time. The compact transmitter is particularly user-friendly because the alarm can be activated both by pressing the red button and also by pulling the cord. This makes operation even easier. The N46 Wall Transmitter is a multi-functional, stationary radio transmitter with which patients and nursing staff can make an emergency call right in the patient’s room, request help or cancel a call. It is integrated into a NurseCall system. At an advanced age, trips and falls have to be expected more and more if the patient is mobile. The Man Down Sensor sounds an alarm for the nursing staff. RAC alarm contacts secure windows and doors to prevent unplanned night walking and thereby ensure the safety of all residents. The NurseCall dementia system prevents dementia patients from wandering around aimlessly. It is always possible to reset the system or parts thereof in hospitals or nursing homes. The IS75 Personal Tracking Induction Transmitter offers security through personal tracking of dementia patients. At the same time, it offers a certain degree of freedom of motion and independence. With the IS76 Personal Tracking Induction Transmitter, you can find ways which affect the autonomy of the person for his or her own protection but at the same time provide him or her with a high degree of freedom of movement. Both requirements can be met with personal tracking. However, in order to facilitate the daily routine of elderly people, there are various devices which have certain functions and which make it easier for people to find their way as part of their daily routine. An example of such a device is the wrist band transmitter with localisation. S37E Wrist band transmitter – accompanying the person is a transmitter for the supporting nursing staff. This means it is possible to pass areas which are equipped with locating transmitters without activating an alarm. Contact us! If you have questions or require other information, please feel free to contact our employees. We will be happy to further assist you.